We often get caught up in drama and arguments. We wonder why people treat us the way they do or why circumstances happen. What we don't realize is that an invisible battle is taking place between the forces of good and evil. Satan is doing what he can to undermine or thoughts and actions. He is waging a spiritual war on us and we have to be aware of that. We need to discover what's really behind the curtain and aim our strategies and weapons at the real enemy. There's no reason to be afraid, but every reason to be prepared. We should not wage war according to the flesh. 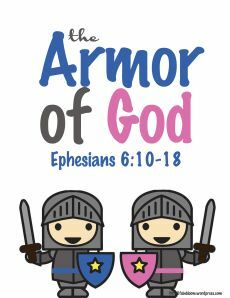 Rather, we should put on the full armor of God. Everything that occurs in the visible, physical world is directly connected to the wrestling match being waged in the invisible, spiritual world. Do not allow Satan to attack your thoughts and make you feel inadequate or overwhelmed. When we have negative feelings or thoughts, or when we are not getting along with someone the best line of defense is to pray, pray, pray! If you are a child of God, Satan cannot destroy you. That battle has already been won. But what he can do is try to make your life on earth unproductive and intimidating. We should always be watchful of our own actions and become more aware of what Satan is trying to do to destroy us. Because of that, we need to be aware of our weaknesses and unhealthy habits. Now that I'm more keen to the spiritual battle, I've found myself not taking things so personally and not allowing anger to boil up so quickly. I have somewhat low feelings of self-worth, but have declared that I will not allow Satan to make me feel inferior or unworthy. After all, I am somebody because I am a child of God! That looks like a great study! I've been looking for something to read, maybe i'll check it out. Have you ever read "Woman after God's own Heart" I've read it about 3 times and always find some great lessons! I so appreciate this because we have been looking at what we want to do our next study looking at... & I love me some Priscilla! She is just so wise with her knowledge! I definitely have a tendency to be quick to anger. It's gotten a bit better with age. But I still struggle. Always good to be reminded to take a deep breath & try to calm myself before I boil over. Stopping by from the blog hop! This sounds like a very interesting and insightful study. It's so interesting to think about the struggles and drama we face on a daily basis in a different light. Stopping by from the blog hop! It is nice to find new blogs! So many people struggle with anger, myself included. I am working very hard to get better with handling my anger and how quickly I react. It is great to hear a different perspective. Hi there - happy to find you from the hop! You have QUITE the blended family. Shame about the lack of maid, hey? Got any tips on how to make sure everyone feels heard? I also have a part-time blended family, and would love some insight. Looks like an interesting read. I think too many these days are quick to judge. I think it would be Better if we all focused on our own actions instead of judging others. And definitely not let others bring down our self worth. Great finding you through the blog hop. I have feelings of doubt and low productivity too. I do a lot of reading, using the tools that God has allowed me to have access to, to keep myself motivated. Books are a great resource and I'm going to check out this one. I'm following you on Bloglovin now too. Thank you for the encouragement. It's easy to get caught up in the moment. When we get angry with others it is easy to act on that anger in a way that does not glorify God. This is extremely dangerous when it might be the only interaction with a Christ follower that person has. How are we being like Christ when we lash out from our anger?